This is pretty old - it won an award earlier this year - but it's just hit my radar thanks to an appearance on Digg. 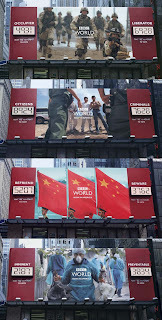 The campaign was to promote the launch of BBC World in America, and consisted of 4 different pictures, up in the same spot on different days, allowing passers by to vote on their perception of the picture, with live display of results. Really great stuff, and also an illustration of how Digg can amplify relatively obscure stories, or turn trade stories into general interest stories.